The United States Congress designated the Magic Mountain Wilderness (map) in 2009 and it now has a total of 11,938 acres. All of this wilderness is located in California and is managed by the Forest Service. The Magic Mountain Wilderness' chaparral covered hillsides and oak-studded canyons provide scenic vistas and recreational opportunities for the rapidly urbanizing Santa Clarita Valley. 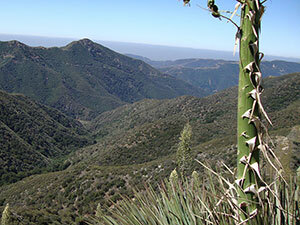 The Magic Mountain Wilderness lies within the newly designated San Gabriel Mountains National Monument. It also provides suitable habitat for the California condor. There are no officially designated trails that exist within this wilderness. Planning to Visit the Magic Mountain Wilderness? How to follow the seven standard Leave No Trace principles differs in different parts of the country (desert vs. Rocky Mountains). Click on any of the principles listed below to learn more about how they apply in the Magic Mountain Wilderness.